+++ Thom has included five hidden N’s in Bambi’s First Year, representing the 5th piece in the Disney Dreams Collection. It is the second release in 2010, as well as the second release in the Epic Eight masterpieces scheduled to release in 2010. +++ The central theme of Bambi, the cycle of life, is represented in Bambi’s First Year, by the flow of water. 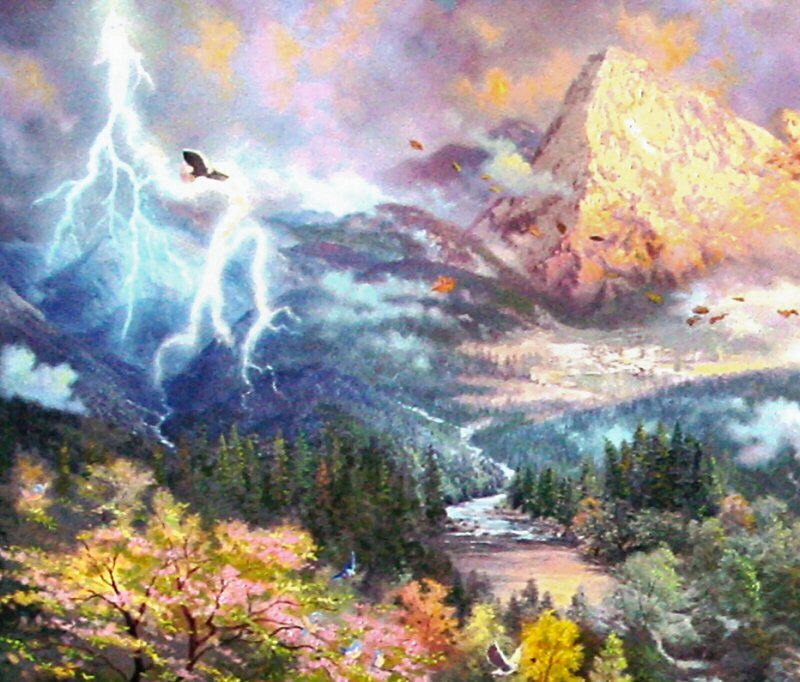 We see rain which causes snow on the mountains and rivers on the hillside which eventually join with other rivers and cascade over thunderous waterfalls. The element of waterfalls is an effective symbol of the on-going life force of nature. 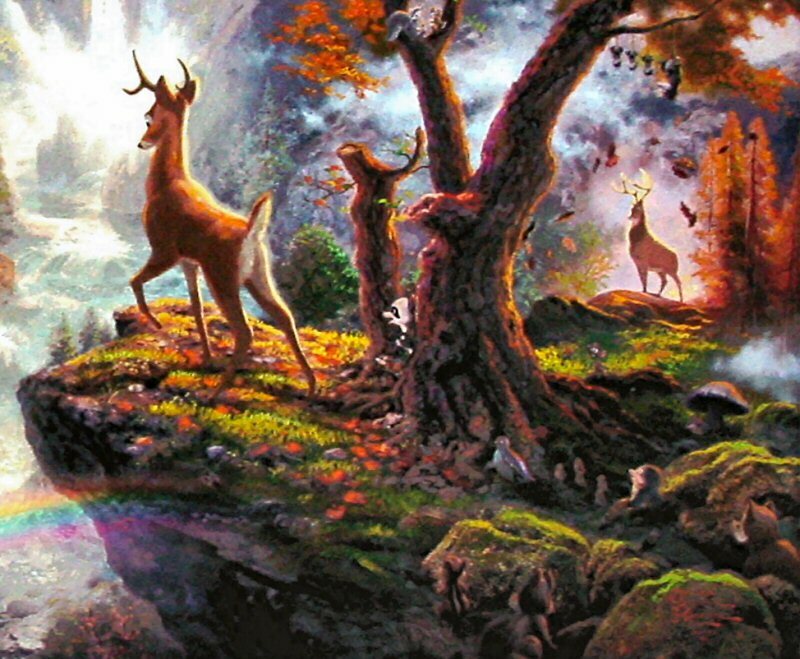 +++ The rainbow at the lower center of the composition suggests that Bambi, as he is perched on the ridge, is perhaps viewing vision of his early life as seen through the reflective light of memory. The detail and flowers in Bambi’s First Year suggest the innocence and resplendent beauty of spring. +++ Thom has pictured Bambi three times in the image, representing Bambi’s participation in various seasons. 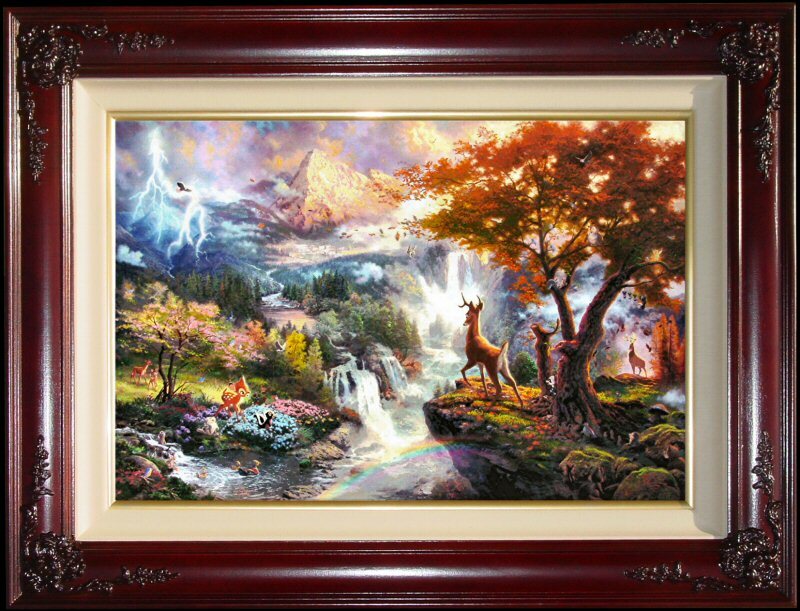 The spring world of Bambi as a young deer is seen on the lower left, the summer world of storms and lightening which transitions to the winter world of the high mountains, and Bambi as the playful participant in the joys of snowfall. To the right is “autumn world”, the moment of Bambi’s eventual empowerment. Make note of the great stag in the distant, silhouetted against the rising mist of an autumn forest. Bambi looks over the scenes of his first year and like the butterfly above him, has emerged from the chrysalis of youth into the empowerment of a young adult. +++ The mountain in the distance of Bambi’s First Year features the suggestion of the face of Bambi’s mother. Thom intends this element to suggest that the mother is in essence the guiding spirit to Bambi’s life – or in the visual terms of the painting, the “spirit of wilderness”, and as such resides on the towering mountain that is always in view. +++ As is the case with all of Thom’s Disney Dreams Collection, his intention with Bambi’s First Year is to create a panoramic image that suggests the element of the Bambi story and to expand the world in which the characters live to new epic proportions. The mood and drama of this painting is the best one in the collection so far. 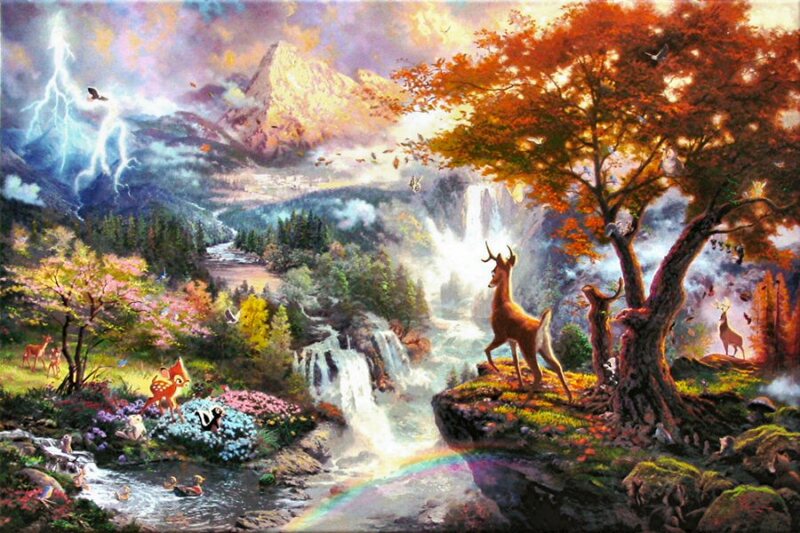 Bambi’s First Year is the fifth painting in Thomas Kinkade's new Disney series entitled Disney Dreams. 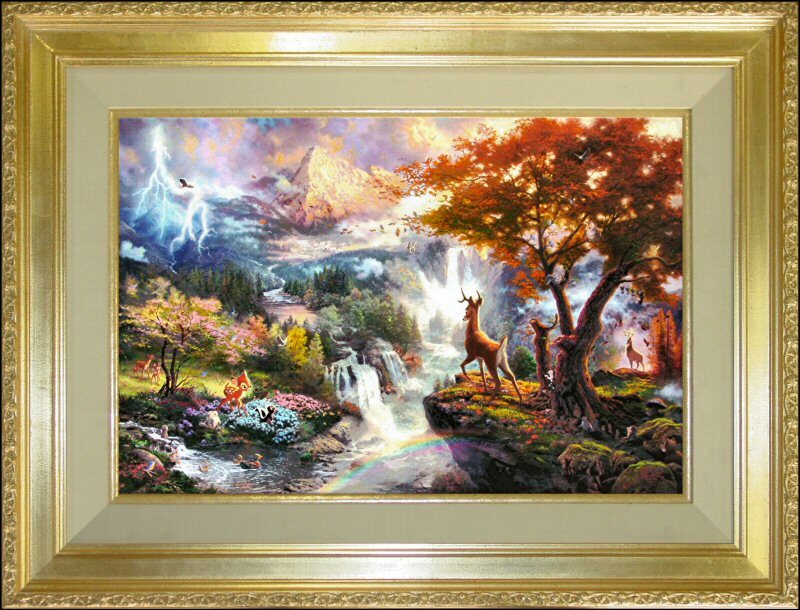 ++++ Brass Plaque with the legend "Bambi’s First Year ~~Thomas Kinkade"
"When I set myself the goal of creating the twelve epic paintings for the Disney Dreams Collection, I knew it would be a vast undertaking. After all, each painting in the series presents not just a scene from a classic Disney feature, but a vision of the entire movie in one image – what I like to call a “narrative panorama”. In my Bambi painting, I wanted to present a broad look at the events of Bambi’s young life, along with the suggestion of his destiny as the newly crowned prince of the forest. To suggest the moment of Bambi’s empowerment, I positioned him on a rocky precipice overlooking the terrain of his kingdom and the four seasons of his first year. Below him is an image of his own self at a younger age, representing the spring of his life. Surrounding the young Bambi we see the animals of the unspoiled forest – Thumper the rabbit, Flower the skunk, Mole, Otter, and at the left, Bambi’s first love Faline and her protective mother. These gentle animals are reminders that even a prince depends on the loving care of friends and family. If you look closely, Bambi’s self-sacrificing mother can be seen, as though emerging through the mists of memory, as a half hidden image upon the distant mountain. Truly, a mother’s love, like the spirit of the mighty mountains, will guide a son forever. The lightning and rains at the left of the composition create a visual transition to the second season of Bambi’s life: summer. Further back, below the majestic mountain in the distance, we see a suggestion of Bambi’s winter world, a whimsical season in the movie featuring the playful antics of Bambi and friends in a frozen wonderland. Bambi’s autumn is the season of his maturity. At the right of my composition we see the fall colors ablaze above the young adult Bambi, as the wisest and mightiest creature of the forest, the old stag, looks on approvingly through a rising mist in the afternoon light. The central theme of Bambi is the cycle of the seasons and the ongoing flow of life. 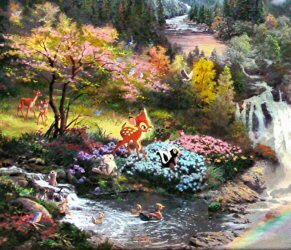 Waterfalls and rivulets abound in the Bambi movie, suggesting the unstoppable life force, and in my painting we see these cascades just beyond a misty rainbow. Truly, water flows through the world like life itself – a timeless reminder that despite the passing seasons, nature thrives and a new generation is born. I believe Bambi’s First Year is the most breathtaking subject in my Disney Dreams Collection to date. I attempted to capture the sublime beauty of the forest, combined with the wonderful charm of the forest animals and their playful everyday activities. I hope as you look at Bambi cresting the ridge of his domain, you too will feel empowered to live your best life and to count on a season of new beginnings, even when the challenges of life confront you. Truly for Bambi, and for us, life goes on."